October is National Cyber Security Awareness Month and next Tuesday is National Clean Your Virtual Desktop Day. Now is a good time to check-in on your computer use and internet safety. To the average computer user, the tasks required to be secure can be overwhelming. 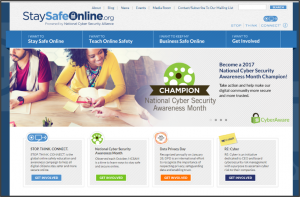 But, StaySafeOnline.org allows you to find all the information you need in one place. Passwords – Make sure they are secure. A combination of numbers, letters, and symbols is best. Use a unique password for every account. Antivirus Protection – Don’t use a machine (computer, mobile phone, etc.) that does not have virus protection. Unsecured Wireless Networks – Use them cautiously. Tapping into a free hotspot may be tempting when traveling, but depending on who is watching (and you never know who is), you could be putting your information at risk. Never login to your personal accounts when using free wireless. If you do, you might be giving all your information to a scammer. Securing Your Internet – This task is simple. If you have an online account with your internet provider, login to change the router’s name and the pre-set password. Having trouble doing it on your own? Just call the company for help. Scams – For most, using the internet is virtually free. So, many scams start online. The Computer Tech Support scam can start with a pop-up message that claims your computer is at risk for viruses, advising of a phone number to call to rectify the issue. Email scams often conform to a phishing scam, claiming to be a financial institution that says you need to reset your password. Other forms of email scams include attachments or links that, when downloaded, infect your computer with viruses. Click here to sign up for our office’s scam alerts. Failing to take precautions regarding computer and internet safety is like keeping your front door wide open to a neighborhood thief. Don’t do it. Be smart about your computer use. Take precautions to combat scammers before they target you. Do you own a small business and have concerns about data security? Join us at Tech Jam on October 20th for information – details and registration can be found here. This entry was posted in Consumer by sanders. Bookmark the permalink.